DRESDEN, Germany -- An American man suffered minor injuries in Dresden after being punched for making a Nazi salute while drunk in a bar, German police said Sunday. The 41-year-old man "was very drunk" early Saturday morning when he made the "Hitler greeting" at a bar in the Neustadt district of Dresden, deputy police chief Lutz Milker said. "He didn't say anything -- just the salute. So far we have no explanation why." 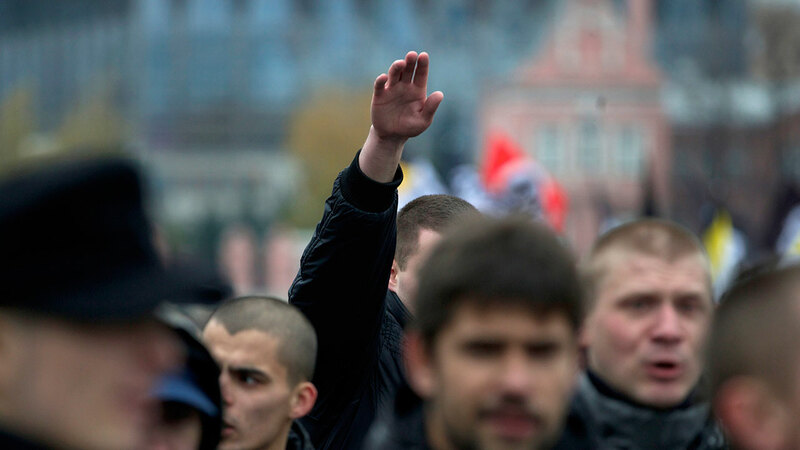 The Nazi salute, Hitlergru in German, is performed with the right arm straight and pointed forward slightly at an angle upward with palm down. It was commonly used during the Third Reich as a greeting and to show loyalty to the Nazi regime. After the tourist stepped outside the bar, "someone hit him, and he had minor injuries to the head," Milker said. Paramedics bandaged him on the scene and he was not hospitalized. Police would not identify the man, in accordance with German law, but said he was cited for making the salute, which is illegal in Germany. The state prosecutor will examine the case and determine if he should be formally charged, Milker said. German law forbids the use of of this salute, along with uniforms and flags, unless it is being used for arts or science, research or teaching. Last week, two Chinese tourists were arrested in Berlin for performing the banned salute in front of the city's parliament building. The two were charged and fined 500 each.